Abstract: Morphostructure pattern suggests rotation of the Orava block along the Orava transforming transversal fault. The shortening of the Western Carpathians during their shift to the north in a N–S direction is well known, but the press in between the Bohemian Massif and the European Platform also caused substantial shortening in a W–E direction. The crucial role for such tectonic processes was played by the transversal Orava Fault and Orava block rotation. Paleomagnetic preliminary results and geophysical data seem to confirm such a hypothesis. Abstract: Lithological, sedimentological and paleoecological studies of the Lower Cretaceous (KB1-A section, Ternberg Nappe, Northern Calcareous Alps, Upper Austria) uncovered rich spectra of Early Berriasian to Late Valanginian macro- and microfaunal elements in addition to microfloral members. The evaluation of the thin sections indicates a change from a calpionellid facies to an echinoid facies within the Steinmühl Formation whereas the Schrambach Formation consists of mudstones with rare microfossils. Several compositional changes in calcareous dinoflagellate and calpionellid assemblages (bio-events) are detected at the Austrian KB1-A section. They correspond to eustatic sea-level fluctuations observed in Lower Cretaceous sections of the Western Carpathians and correlate with the Nozdrovice Breccia (Nozdrovice Event) at the end of the Late Berriasian (Calpionellopsis Zone) and with the Oravice Turbidite Event at the Early Valanginian (Calpionellites Zone). The surface of the topmost bed of the Steinmühl Formation (latest Early Valanginian) is characterized by an accumulation of pygopids, partly eroded ammonoids with crinoidal epifaunas, and belemnites with Acrothoracica burrows. Additionally, a probably small biostratigraphic gap in the calpionellid subzonation between the Steinmühl- and the Schrambach Formations show a sedimentation stop (omission) during the pygopid accumulation. Abstract: The Upper Cenomanian-Lower Turonian flysch deposits of the Subsilesian Unit of the Outer Western Carpathians include a characteristic interval of green and black, siliceous shales with manganese concretions, benthonites and tuff, with abundant radiolarian fauna. Thirty two species of Radiolaria have been identified. Spherical cryptothoracic and cryptocephalic Nassellaria dominate in the assemblage. 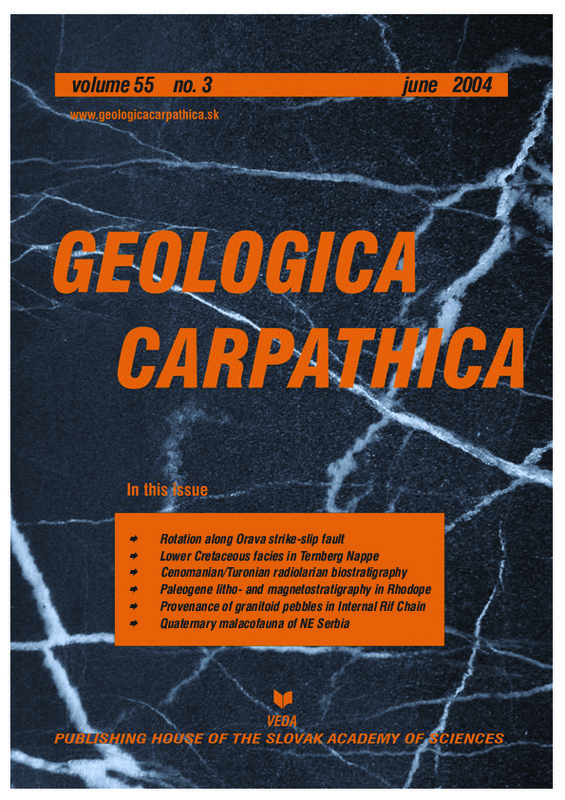 Two radiolarian species: Alievium superbum and Crucella cachensis have been proposed as biomarkers for setting the Cenomanian–Turonian boundary interval in the deposits of the Subsilesian series of the Polish Outer Carpathians. Abstract: Two multiple stratified volcano-sedimentary Paleogene sections built of breccia-conglomerates and sandstones (incl. epiclastic), marls, limestones (incl. reef and bioclastic) and zeolitized pyroclastic rocks (interpreted as pyroclastic flow deposits mainly) were studied and correlated. The deposits are divided into superposed and interfingered informal lithostratigraphic units. The natural remanent magnetization of the zeolitized pyroclastics was determined as thermal remanent magnetization (TRM) or partial TRM, and that of the sediments — as detrital remanent magnetization and post-detrital remanent magnetization. The characteristic remanent directions allowed straightforward construction of magnetostratigraphic profiles and yielded 12 reliable magnetic polarity zones and sequences of zones in the sections studied. The correlation of the sections was based on the magnetic polarity zones position, lithological features of the rocks and three 40Ar/39Ar age determinations of the zeolitized pyroclastics from different levels of the sections. The consistent (Rupelian — 32.28±0.07 to 31.82±0.07) ages plot entirely into the 12r polarity chron on the Geomagnetic Polarity Time Scale (GPTS) (Cande & Kent 1995). The data presented show that the polystage formation of the pyroclastic flows and the change of the contemporaneous sedimentation from clastic to biogenic took place in a relatively short time span of about 0.46 Ma. Abstract: The Oligocene-Miocene deposits of the Internal Domains and of the innermost sectors of the flysch basin, recognized along the Betic-Rifian Chain (Spain and Morocco; i.e. Malaguide/Ghomaride Units and mauretanien flysch, respectively), are characterized by the occurrence of crystalline pebbles within several conglomerate horizons. Their provenance is difficult to explain because of the absence of similar rocks in the pre-Alpine Paleozoic basement nappes of this chain. Geochemical characters of seven granitoid pebbles (two-mica, cordierite-bearing monzogranite up to leuco-monzogranite), sampled from conglomerate lithofacies occurring within the above mentioned sandstone suites (Internal Rif and mauretanien sector of the flysch basin), have been determined and compared with other plutonic rocks of the Western Mediterranean and Iberian areas in order to detect their provenance. This comparison has been realized with the syn- to late-Hercynian plutonic bodies widespread in the Iberian, Moroccan (109 analyses from north-eastern Morocco, western High Atlas and from western-central Anti-Atlas), Kabylian and Calabria-Peloritani massifs (14 and 282 analyses, respectively) and with the pre-Hercynian Pan-African plutonites of Algeria (55 analyses). The obtained results show very strong geochemical affinities only with the Hercynian granitoids of the Iberian Massif (115 analyses from central Spain and from northern and central Portugal), thus emphasizing a new hypothesis for the provenance of the analysed pebbles with important paleogeographical consequences. Such a hypothesis of provenance, in fact, shows evidence that the AlKaPeCa block (i.e. Alboran–Spain + Kabylides–Algeria + Calabria + Peloritani massifs — southern Italy), at least during Oligocene times, must have been still in crustal continuity with the Iberian Massif, supposed to be the source area of the studied plutonic pebbles. Abstract: A short description of gastropod fauna from loess sediments from the Smederevo vicinity is presented. The material was collected from four localities in 2002. Due to the terrain coverage observation of loess sediments was not possible on some occasions, while on the other hand, the correlation between our profiles and neighbouring boreholes were possible in some instances. Further studies will include other analyses from sediments, deposited in freshwater environments during the Early and middle Pleistocene and they will also include sedimentological analyses.